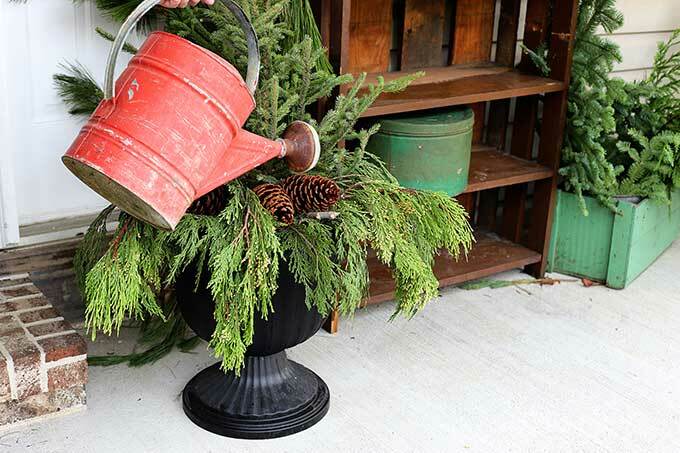 Every year I show you how I make the porch pots as part of my outdoor holiday decorations on the porch. Last year they were very festive with lots of red accents and had more of a Christmas vibe to them. The year before, they had somewhat of a farmhouse look. 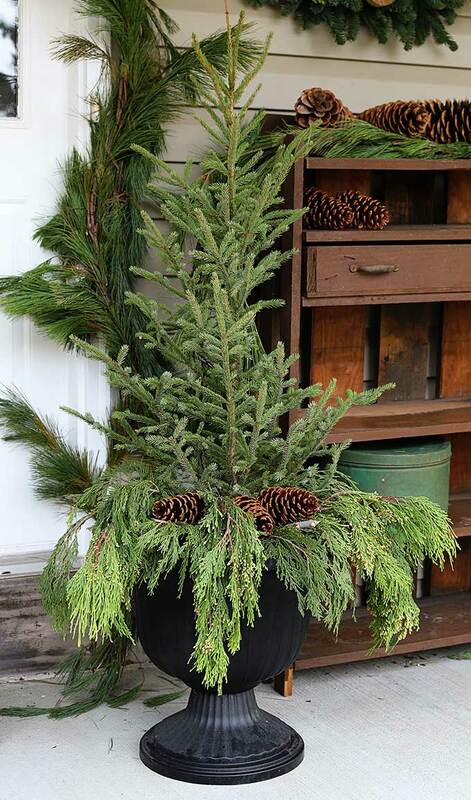 This year I decided to go with a classic look using cut trees in urns surrounded by cedar boughs. 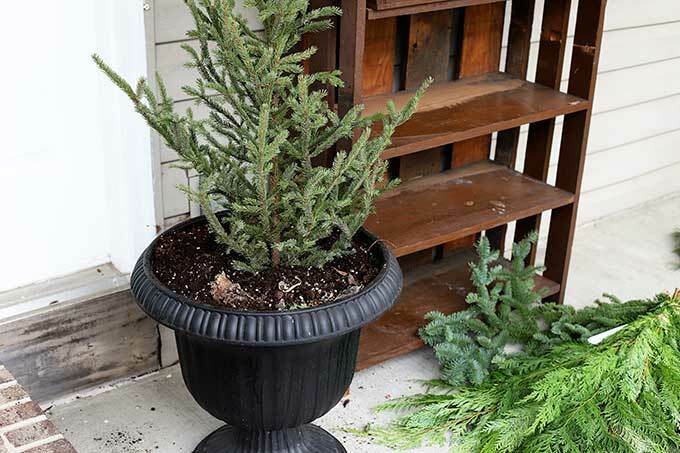 It’s a simple look that is VERY EASY to do yourself, yet it makes a great impact on your winter porch. 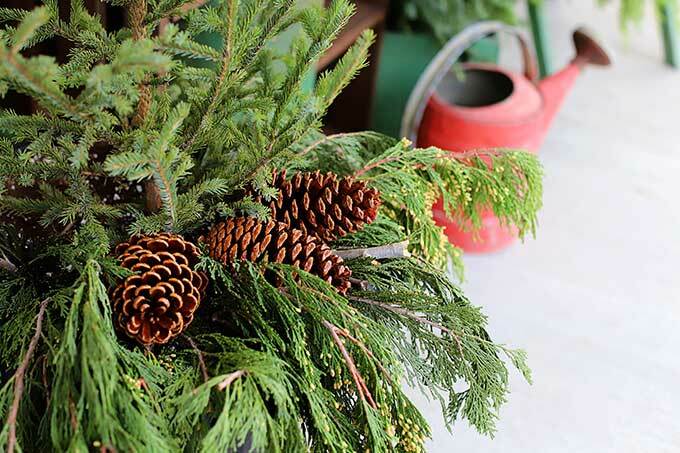 Even though the trees seem a bit more on the Christmas side of things (with pine trees in them), they will still hold up well design-wise after the holidays. My goals with these pots are to make them something that can go from late November well into February. And maybe even beyond. 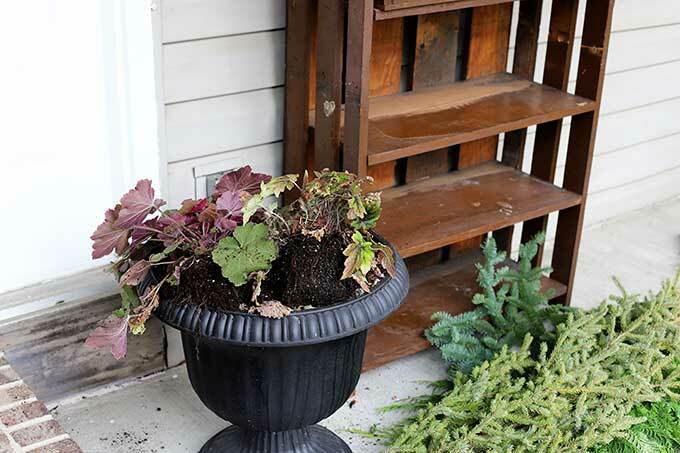 Since I was using an urn that previously held my Fall Foliage Planter, I started off by removing the perennial plants that I wanted to transplant into the ground. The Coral Bells and Foamflower are now happily living in the flower bed directly in front of the porch. And then I cut the other existing plants down to the ground. This gives the trees and cedar a nice firm place to be “planted”. I’m using air quotes, because there really is no planting involved. It’s more like poking. 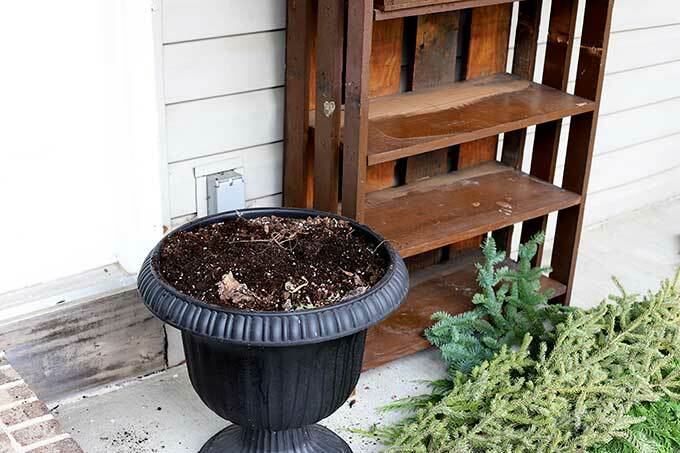 If you do not have a plant currently living in the planter you are using you can, of course, just fill the planter with dirt. 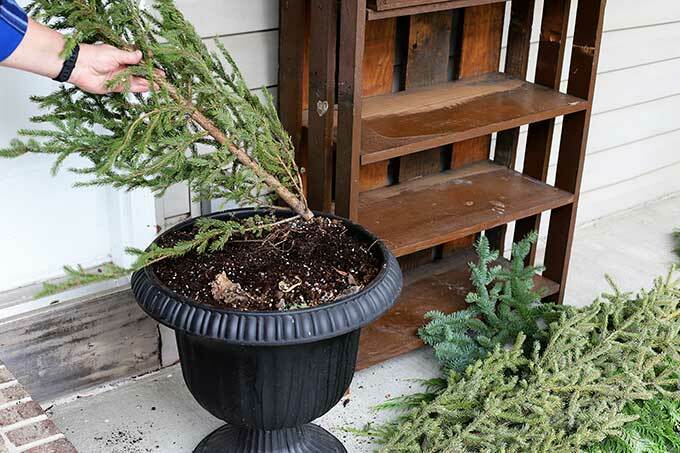 Make a clean cut on your trees and remove any very low branches, placing your tree firmly in the middle of the planter. (This is where the poking part comes in). I poked mine down roughly 6 inches. 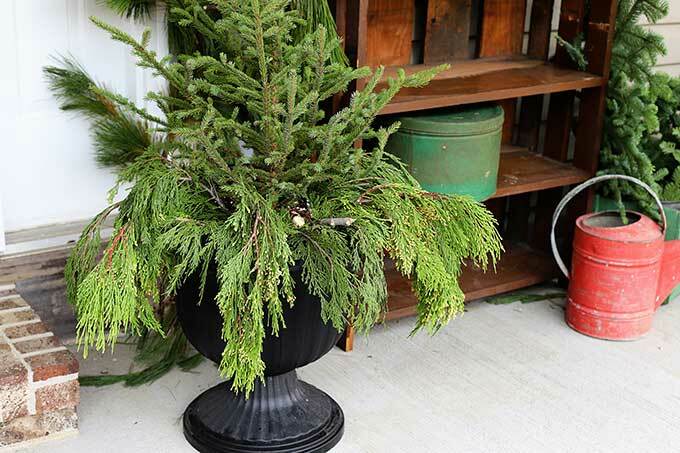 Then take your cedar boughs and poke into the soil at an angle, so they cascade over the sides of the planter. Like I mentioned above, the Incense variety is very droopy, for lack of a better term, but any cedar will work. 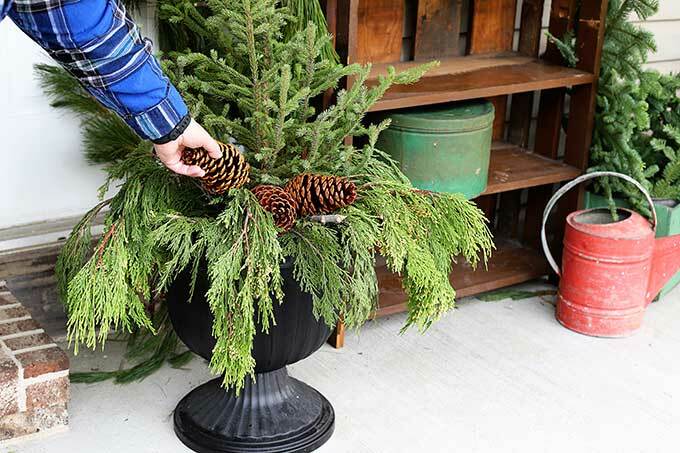 When you have the boughs situated how you like, add in a few pinecones to the front of the pot. My pinecones were your run of the mill, large sized ordinary pinecones. If you want SUPER LARGE pinecones, look for the ones called sugar pinecones. They’re enormous. This is the first and last time you will water it. EVER. The water will freeze and hold the greens firmly in place. They will soak up a little bit of the water here and there when it thaws and refreezes throughout the winter, but seriously, no need to water these guys again. I don’t want anyone catching pneumonia watering these in your bathrobe and slippers or anything! I live in Ohio, zone 6a, and my porch planters last well into February. Probably longer, but close to the end of February I start itching to switch them out to something more spring-like. 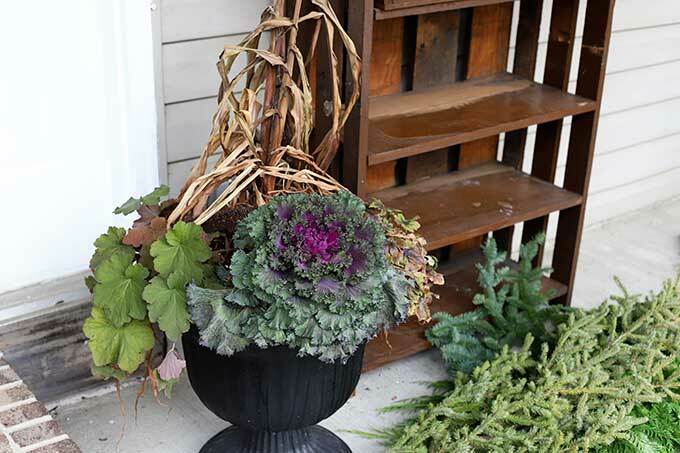 Have you made your porch planters yet? Am I the only one OBSESSED with making these things!!! I love your simple planters, Pam! They are really lovely! I do something similar, using the multi colored kale I had in the pots for fall and putting in mixed cut greens and a few stems of gold glitter stems around them. 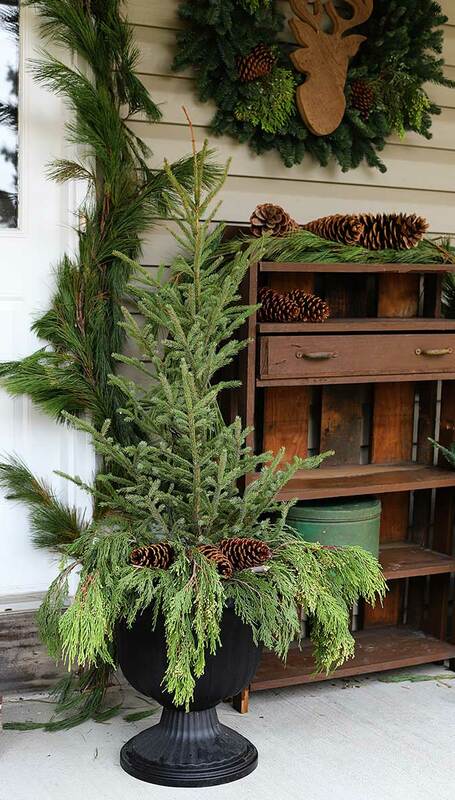 I look forward to your porch decor every Christmas! You always have a breathtaking arrangement.I will copy this one for sure! I am thinking something with some really cool plaid thermos bottles on that awesome shelf??? Thanks Pam. I do this every year but never get it qiite as full with plants, as I like to add other garden things in. Like a birdhouse. I never watered the container before. IlI’ do that from now on. PLANTERS! THEY SEEM SO SIMPLE, BUT PEFECTLY HOMEY. AGAIN FOR ALL YOU DO! FOUND SOME GREAT IDEAS THERE TOO! You are too kind! You have made my day!